I have two of these, one in a really pretty cobalt blue and then the basic black. The tip on these is nice. It comes to a very fine point. The major problem I have with these is that the liquid liner does not extend enough to the tip. All the color and product is concentrated at the base of the felt tip pen, so when trying to draw a fine line or point using the tip of the brush, very little pr...read moreoduct is there to work with. It is only at the thicker base of the pen that the liner is dispensed with ease. This makes it so frustrating to work with! Only when I lay the pen on its side can I get any real product out and it comes out messy. I have used several types of liquid liners...brushes and pens and this one had one of the most fatal flaws I have ever seen. The only thing worse would be if it came dried out completely. It couldn't be that my pen just dried out at only the tip, because I experienced this difficulty on my very first use of each. I thought I may have had a dud (I tried the blue liner first) but I experienced the same frustration with the black liner. 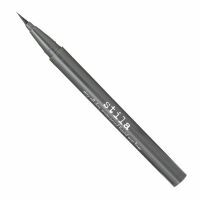 Other reviewers seems to love this liner from Stila, but I will never purchase these liquid liner from Stila again.